Hidalgo is inspired by the true story of Frank T. Hopkins, who goes on a 3,000 mile race across the Arabian Desert. The race was only open to Arabian-Thoroughbreds & Hidalgo is a mixed breed. Can they make the trip without dying of heat first? See Hidalgo and find out!!! This is literally one of the most inspiring movies ever! I promise if you watch it you’ll never regret it. I have it on video, seen it, a little boring but good. Great movie!! Loved it. It had adventure, action, chase scenes, fighting, a bit of romance, and a ton of great horse scenes!! ok so i haven't watched hidalgo... but you guys just put it at THE TOP of my 'MUST SEE SOON'!!!! it sounds awesome.. about horses dying and getting hurt - i guess it's the sort of climax that's just perfect, sad, touching, you know... Thanks. reviews were great & now i reeeelllyyy wanna watch it!!! I love this movie, the bond between man and horse in this movie is amazing. In 1891, wealthy Sheikh Riyadh (Omar Sharif) sends his attaché Aziz (Adam Alexi-Malle ) to invite American Frank Hopkins (Viggo Mortensen), and his mustang, Hidalgo, to enter the "Ocean of Fire," an annual 3,000-mile survival race across the Najd desert region, a race traditionally restricted to pure-bred Arabian horses. I would recommend this movie for children 13+ [depending on the child, I watched Hidalgo at 12 and was fine] as there are some scenes of violence and horse deaths. This is one of my favorite horse movies. I was sad when I found out that the story actually isn't true, but I still love it. i love this movie. it is very touching. I LOVE THIS MOVIE AND STORY!!!!!!! OMG... I watched this when I was a little girl and I fell in love with it. I researched this story and Hidalgo's descendants are still in the black hills of south Dakota. I've been to the place where they free all the mustangs at the end. It was amazing. I've written soooo many reports and essays about this story. But the sad thing is that I cannot find the movie anywhere! I mean I love it so if someone finds it tag it or post it! Note from Sydney: Hi Jade, buy it from Amazon. Simply visit this URL. Thanks! As with the other Breyer sponsored movies (The Horse Whisperer, Seabiscuit, Dreamer, Spirit) this is an instant horse classic. Based on a true story of an American endurance rider in the 1800s and his mustang. The filming and acting are both top quality. However, it does have some violence, heavy drinking, and concepts that would be beyond an 8yo to really enjoy. It is PG-13 for good reason. Very touching movie. Frank is good with Hidalgo. This is a good movie! It's inspiring and since it's historical, I got to use it in my school. *sigh* I LOVE being home-schooled! Hi, my name is Nikee. I'm 13 years old and i luv this movie!!!!! It's one of my favorites!!! It has one part that I had to look away because the horse gets hurt real bad, but other than that, great movie!!!!! I hate the part where a horse falls into a pit and he gets stabbed by the sharp sticks! It's sad. and I really wonder how the horses get water!? 3,000 mile race! I walked 18 miles once and I was very, very, very thirsty and tired. I think the movie is sad. This was and still is the best movie! I watched it over and over. After school I was watching this movie, I love it. 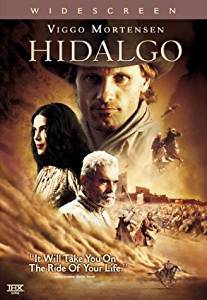 I just saw the last 15 minutes of Hidalgo last night and, being an animal lover, knew I had to find the movie. Just the final 15 minutes was so real, so inspirational I knew I had to see it all. It showed the true bond between horses and the people who truly love them. But horses getting killed? I'm not sure I could watch that part. Or maybe I should, just to become a realist about what can happen with horses. Thank you for providing this website where people like me can track down wonderful horse movies. 3. It is not just for horse lovers, anyone can watch it, as it has great actors and a wonderful story, highly recommended, it's my favourite horse film, humour, happiness, sadness and friendship, just perfect! The horse is so pretty!!!!!!! BUT IT IS A REALLY COOL MOVIE. U HAVE 2 SEE IT!! that was a sad but great movie!! I absolutely love this movie. I've seen many horse movies, but this one is by FAR my favourite. If you love paint horses, you'll love this movie. The bond between man and loyal horse is amazing. Everyone should have that kind of a relationship with their horse. Well 1st of all, Hidalgo is NOT a mixed-breed, he is a Mustang. And 2nd, this is a very good movie but not for younger kids (there are inappropriate parts and things that could kids give nightmares). But overall I love the movie! He races his Mustang against a bunch of Arabians across the desert. How can a horse run so far in the heat of the desert? !The little paint mustang Hidalgo is so fast! !